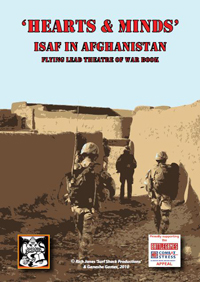 This supplement for Flying Lead takes the players to arid deserts and lush ‘Green Zone’ of Afghanistan. Fought over for centuries by major powers, it is now the key to winning the ‘war on terror’. Hearts & Minds is a detailed supplement for Flying Lead: 14 scenarios, force advancements and campaign rules. Expanded combat and vehicle rules; new ‘Joys of War’ cards add uncertainty to the ‘historical’ setting. Force-specific rules, new abilities and force rosters, rules for the latest ISAF advanced technology. In conjunction with Battlegames Magazine, we are contributing $2 per copy sold to the Combat Stress Appeal.